There are 24 blog entries for June 2011. Thursday, June 30th, 2011 at 11:47am. According to an article written by a community editor at "Community from HomeAway" an online organization that deals with optimizing your vacation rental business, the following points were made: When you are thinking about how you will manage the rental of your vacation home, you have to choose which management style will work best for you. Wednesday, June 29th, 2011 at 10:09am. The May 2011 Residential Resales Statistics Press Release* can be downloaded HERE. 1. Monthly Indicators ~ Reports will include number of closed sales, median sales prices, new listings, pending sales, days on market. > Download the May 2011 Month Indicators HERE. 2. Housing Supply Outlook ~ A detailed analysis by property type and price range demonstrating current trends. > Download the May 2011 Housing Supply Outlook HERE. 3. Local Market Updates ~ Individual reports for the various neighborhoods which display both single-family and condominium sales activity. > Download the May 2011 Local Market Updates HERE. Wednesday, June 29th, 2011 at 9:39am. One month after reporting that its home price gauge had officially double dipped, Standard & Poor’s says prices have inched up, in line with the expected seasonal boost that accompanies the spring buying season. The 20-city composite reading of the S&P/Case-Shiller indices posted a 0.7 percent increase in April versus March. The 10-city composite was up 0.8 percent. It’s the first time the two measurements have posted monthly gains in eight months. Both indices are lower than a year ago. The 20-city composite remains 4.0 percent below April 2010, while the 10-city reading is down 3.1 percent. Looking at the monthly movement, even in the midst of the spring season, it wasn’t all up and up. Tuesday, June 28th, 2011 at 11:08am. Tuesday, June 28th, 2011 at 8:49am. Great rates are here - for a little while anyway! Investors focused on the Fed meeting and Greece this week. A reduced growth forecast from the Fed and continued concerns about the situation in Greece helped mortgage rates move a little lower. Friday, June 24th, 2011 at 12:08pm. According to Travel Video News, "Waikiki Beach Walk and Outrigger Enterprises Group are pleased to present the 2nd Annual Hawaiian Steel Guitar Festival this July as part of Outrigger's ongoing Na Mele No Na Pua Music Heritage Program. The month-long celebration will feature some of the islands best steel guitarists, as well as artists new to the instrument, on stage at Waikiki Beach Walk every Sunday evening during the month, with performances on July 3, 10, 17, 24, and 31." Thursday, June 23rd, 2011 at 12:37pm. WASHINGTON — Fixed mortgage rates were mostly unchanged this week, hovering near yearly lows. The average rate on the 30-year loan held steady at 4.50%, Freddie Mac said Thursday. It hit 4.49% two weeks ago, the lowest level this year. The average rate on the 15-year fixed mortgage, popular for refinancing, inched up to 3.69%. Last week it reached a yearly low of 3.67%. Rates typically track the yield on the 10-year Treasury note. That yield has been dropping in recent weeks based on weak data that points to a slower economy. Tuesday, June 21st, 2011 at 9:50am. “Home prices are rising or very stable in local markets with improved employment conditions, such as in North Dakota, Alaska, Washington, D.C., and many parts of Texas,” notes Lawrence Yun, NAR chief economist. Friday, June 17th, 2011 at 11:17am. 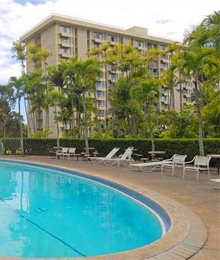 According to Pacific Business News and RealtyTrac, "Foreclosures in Hawaii fell nearly 15 percent in May compared to the same month last year." There were a total of 900 homes with foreclosure filings last month, including 87 notices of default, 438 trustee sales and 375 bank repossessions, according to Irvine, Calif.-based RealtyTrac. One in every 573 housing units in the Islands received a foreclosure filing. That placed Hawaii 12th in the nation, meaning that only 11 states had worse foreclosure percentages. Thursday, June 16th, 2011 at 10:44am. According to "RealtorMag", found online at www.Realtor.org, "More people are applying for mortgages: Applications for home mortgages had their largest increase in three months due to falling record-low interest rates, the Mortgage Bankers Association reports. MBA's seasonally adjusted index of mortgage application activity increased 13 percent for the week ended June 10. That marks the index's biggest gain since March. The index measures applications for refinancing and purchase demand." Read, the rest of the article, "Mortgage Applications Surge Amid Falling Rates".